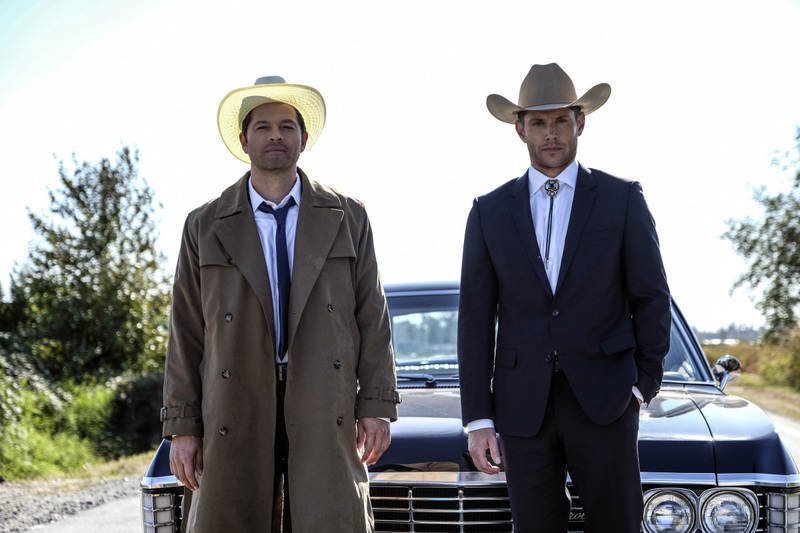 Official CW description with spoilers for the Supernatural episode "Tombstone"
GO AHEAD…MAKE MY DAY – Castiel (Misha Collins) is reunited with Jack (Alexander Calvert) and together with Sam (Jared Padalecki) and Dean (Jensen Ackles), they head to a sleepy old western town to investigate a murder. Dean gets to live out his boyhood fantasy when he comes face to face with a famous, gun-slinging outlaw. Nina Lopez-Corrado directed the episode written by Davy Perez (#1306). Original airdate 11/16/2017. Come talk about Supernatural on our discussion forum for the show! UPDATE: We now have some preview images! Welcome back, Cas! Supernatural -- "Tombstone" -- Image Number: SN1306a_0079b.jpg -- Pictured (L-R): Misha Collins as Castiel and Jensen Ackles as Dean -- Photo: Bettina Strauss/The CW -- ÃÂ© 2017 The CW Network, LLC All Rights Reserved.